How can Formula 1 expand? There is no shortage of venues around the world which would like to host a Grand Prix. It seems that every month there is another plan revealed. But it is not that easy. To begin with hosting a Grand Prix is vastly expensive. Even if you have a venue which is up to Formula 1's demanding safety standards, you still need to find around $10m a year in fees to get the Formula 1 circus to come and visit. And for that you have to sign over most of your potential sources of revenue: TV revenues, merchandising, corporate hospitality and trackside advertising must all be handed over as part of the deal. As a race promoter you have to survive on the number of people you can get through the gate. It is a big risk. The answer in many countries has been to ask the local government for help. The region in which a race takes place gains enormously from the event and not simply in terms of international exposure. There are the direct revenues which flow in as a result of the thousands of visitors who flock to watch the race. Governments get taxes from this. 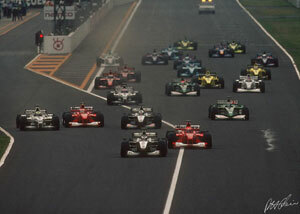 In a 1999 study called "The Economic Impact of the European Grands Prix" it was revealed that in 1997 the average race in Europe generated $44.53m in direct income. This did not include what a region gained in terms of income resulting from tourists who decided to visit the area as a result of the free advertising generated by the event. Nor does it include the effect of the race on the growth of local service industries. And it must also be pointed out that the average figure was dragged down by the underperforming Portuguese Grand Prix which generated only $10.70m. Monaco, for example, was reckoned to have earned the region over $70m. And these figures are three years out of date. A study on last year's Malaysian race reckoned that the event generated $140m in income for local businesses. The problem for Formula 1 is that demand is now much greater than supply. The World Championship has been extended to 17 races but the teams are not likely to accept more races. They simply cannot do it. They also do not want to do it because there is a danger that too much of a sport can bore the viewing public. A race every two weeks is about right. This means that Bernie Ecclestone has been able to ramp up the fees he can charge to organizers as there is plenty of competition for races. The problem at the moment, however, is that a lot of the races are on long contracts. Ecclestone likes to have things organized at least five years in advance. Several races have contracts coming up for renewal, notably San Marino, Germany, Japan and Italy but is hard to imagine that any of these will lose its date. Ferrari's influence should take care of the two Italian dates and the only reason a new deal has not been struck in Germany is that the race is being fought over by Hockenheim and the Lausitzring. It is inconceivable that Japan will be dropped given the influence of Honda and the impending arrival of Toyota. The Austrian GP is up for renewal in 2002 and this may provide the opportunity for another race to be added to the calendar, while 2003 will see the contracts with Brazil and Canada up for renegotiation. Both are likely to remain on the calendar as F1 wants to maintain (and indeed increase its profile in the Americas). It is possible that the Canadian date could be replaced by a second American event but the Canadians are likely to fight hard to hold on to their event. The wild card is Belgium where there are constant troubles with the local government and the race has only survived because Spa is such a good track and because Bernie Ecclestone is the race promoter. Given that there are limited opportunities in the future there are a remarkable number of projects under discussions, including Argentina, Egypt, Beirut, Bahrain, Dubai, India, Bali, Singapore, South Africa, Holland, Greece, Croatia, Korea, China, Russia and San Francisco. Some are more serious than others and there are probably other schemes which have not yet come to light but what is very clear is that not all the races being mentioned can happen. Europe remains the dominant force in the F1 calendar with 11 of the 17 races but there is little doubt that F1 wants to get more of a presence in Asia, North America and the Middle East. The perfect calendar would be one in which all three of the major time zones (The Americas, Europe/Africa and Asia/Australasia each had five or six races). At the moment there are only three in the Americas, and three in Asia/Australasia. In the end it will probably be a case of the survival of the fittest. As the fees rise so the less profitable races will fade away. Based on the 1997 study Belgium, Austria and Spain produce the least income for their regions. This is largely because they attract a large percentage of campers (in the case of Austria and Belgium) or they are located close to a large population center and the crowd is made up largely of locals who go home each night. This is a problem for the two Italian races while the European, British and French events generate more money because they take place in remote areas and so people have to find places to stay. There are large number of campers at both the European and French GPs but they seem to spend more money than those who go to Austria and Belgium. Malaysia is a guide to how the maximize benefits of a Grand Prix. The crowd last year was 75% non-local, which perhaps explains the huge income announced. With as many events wanting to be on the calendar as there are actual events, the best way for F1 to expand in the future is to diversify into running another series. In the United States for example NASCAR runs a total of 22 different championships, while the Championship Automobile Racing Teams organization controls both CART and Indy Lights. Bernie Ecclestone's Formula One group of companies already looks after the promotion of Formula 3000 and there has been talk over the years of this being developed into a Division II Formula 1. The problem with that is that is that F3000 has not really attracted much interest and is probably too similar to F1. Next year F3000 is going to Brazil for the first time and so there is some potential in the very long term for the development of Division 1 and Division 2 races with a system of promotion and relegation as in soccer. However with most sports moving towards franchise ownership rather than performance-related structures Formula 3000 may never flourish. It fulfills a role of training drivers but otherwise has little to commend it. It should be added that the best drivers in Formula 1 rarely stop in Formula 3000. They jump straight into F1 from Formula 3. If you look at the men who have won GP races in the last 20 years all the big names did not compete at Formula 3000 level: Nelson Piquet, Alain Prost, Ayrton Senna, Michael Schumacher and Mika Hakkinen all jumped into F1 from Formula 3. And that trend continues today with Jenson Button and Jarno Trulli being the most recent F3 graduates to go straight into F1. It is more likely that Formula One Management might one day make a bid for the commercial rights for a World Oval Championship. It is doubtful in the current political climate in Europe that Ecclestone will acquire the rights to such a series but it is the logical way for his company to grow. Perhaps it would be best for him to be involved in such a deal as a partner with one of the US organizations which is currently running oval racing series. The obvious partners would be Tony George's Indy Racing League or CART. George is probably the better bet as he is involved in an organization called The Motorsports Alliance, in which Indianapolis and Daytona are partners, which controls more than 15 race tracks across America. It may be that Ecclestone sees his company's future more as a television provider to other sports although knowing the way in which he operates, one should expect expansion in both directions. That will probably only happen after F1 and the European Commission have made their peace and there is a clear understanding of the commercial rules which govern the sport.